This item consists of 100 protectors each. 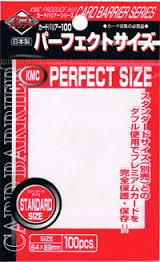 KMC Perfect Size sleeves are clear deck protector sleeves that fit full size cards and still fit into standard size KMC deck protectors. These deck protectors sleeves are 89 mm x 64 mm.